Martel was born during the Kharlan War and raised in the Elven village of Heimdall. During their stay in Heimdall the presence of both her and her younger brother, Mithos, were tolerated despite them both being half-elven. This was unusual due to the elves’ belief that half-elves are the cause of all calamities. For unknown reasons, both of the siblings’ parents were absent since Mithos was very young, leaving Martel as his sole family and caretaker. At some point, two siblings were forced out of the village after being pinned with the blame of a war-related conflict that they were both uninvolved with. The siblings had previously heard that the country of Sylvarant appointed another half-elf to a high-ranking position in the military and traveled there in hopes of finding a place that would accept them. They found that the people of Sylvarant treated half-elves as slaves and that they would be no better off there. After hearing of the Sylvaranti plan to attack the Tethe’allan Royal Capital they made plans to go there instead in hopes of preventing the attack. Their travels were marked with struggles. Martel and Mithos commonly would barely have enough food to eat and sometimes even had to drink muddied water in order to survive. The two also often found themselves helpless to do anything but watch as other half-elves were slaughtered right in front of them as well. Whenever the situation became dire, Martel always made it her priority to support her younger brother and protect him from the cruelty of the world around them. Upon finally reaching the Tethe’allan capital, Martel and her brother knew they would have little chance of securing an audience with the king due to their race and sought out a member of the royal knighthood to hear them instead. The knight captain, Kratos, was receptive to their pleas and agreed to assist them in preventing the attack on the capital. Kratos aided the siblings in every way that he could. He helped both learn how to present themselves when in audience with the king. When the king refused to listen to the half-elves, Kratos then made arrangements for them to negotiate with the Sylvaranti military officer, Yuan, in an attempt to make his country call off the attack. Their efforts ended in failure. Sylvarant attacked the capital and burned it to the ground. Feeling that there would never be an end to the war and that he and his sister would never be accepted, Mithos began yelling at Kratos. “Where are we supposed to go! ?” Martel felt that her brother’s face at the moment was truly frightening, like something inside of him was about to snap. Deep down she knew that they could live anywhere but that they needed to accept that tragedies like the capital would happen over and over again. She told her brother that they needed to overcome this pain if they wanted to change things for half-elves. Martel, Mithos, and Kratos continued to travel together and eventually were joined by Yuan after he was disgraced and chased out of his country. He only followed them with the intent of proving them wrong. He found Martel’s altruism and how she suffered through adversity with a smile in particular to be cloying beyond words. In the end Yuan was the one who came around and changed. He and Martel fell in love with one another. Later on, Martel would take Kratos aside and request that he watch over Mithos. She told him that her brother had difficulty understanding and relating to other people. She knew that Mithos trusted Kratos and wished that Kratos would do everything he could to guide her younger brother and help protect his fragile heart. The group, by then known as the four heroes, managed to bring an end to the Kharlan War. Although the war itself was over the world was still in danger of running out of mana after mana exhaustion caused the Giant Kharlan Tree to die. To prevent the world from running out of mana entirely, Mithos split it into two to wait out the decades it would take Derris-Kharlan to return on its 100 year orbit so its mana could be utilized to germinate the Great Seed. It seemed that Martel could finally have a happy life with her fiancé Yuan after this task was completed. But she was still weak after her battle with Chronic Angelus Crystallus Inofficium, and just as Derris-Kharlan was approaching, Martel was killed as she tried to protect the Great Seed from humans who wanted to monopolize its mana. 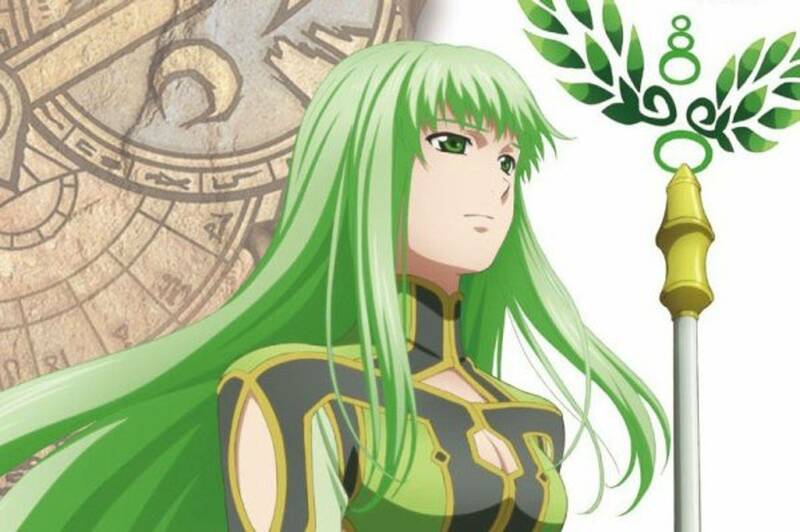 Her last words, “I want to see a world without discrimination,” were misinterpreted by Mithos, which lead him towards the creation of Cruxis and his plan for an age of lifeless beings. Martel’s soul was absorbed into the Great Seed via her Cruxis Crystal. If the seed were to sprout, Martel’s soul would disappear within it. Instead of using Derris-Kharlan’s mana to germinate the seed, Mithos directed it all to Martel to keep her soul within the seed and began his plan to search for a new body that could host Martel’s soul. Martel remained aware of her surroundings for the next 4,000 years, her consciousness still residing within the Great Seed. She could only watch as Mithos went out of control after losing her. Martel’s inability to do anything to stop or reason with him caused her a great deal of suffering. During this time period Cruxis started a religion in both worlds that made her out to be a Goddess, distorting the truth of what really happened during the war. As time passed by, the Great Seed itself began to die. When Lloyd and his friends severed the final mana link in their misguided attempt to germinate the Great Seed, it created an imbalance in the mana protecting the seed that turned it into a rampaging tree that tore the land of Sylvarant apart. When the twisted tree appeared, Lloyd and the others saw a woman, Martel, engulfed within it and her agonizing screams. Kratos remarked that the rampaging tree itself wasMartel. Shooting the mana cannon at the out of control tree helped the Great Seed regain its stability, however Martel was still trapped within it. After Cruxis managed to capture Colette, Martel borrowed the Chosen’s body in order to reason with her brother. She told him that she had been watching him the entire time and begged Mithos to understand that the things he had done were wrong. Martel wanted him to remember what they had striven to achieve together and to return to his old self. Mithos was devastated that Martel did not embrace him and the things that he had done when she awoke and he refused to listen to his sister’s pleas. As Martel began to leave Colette’s body, she said her final farewell to Mithos and asked him to restore the worlds to the way that they were, stating, “If things were going to end up like this, perhaps the elves should never have left Derris-Kharlan. If they hadn’t, people like us would never have been born,” before vanishing. After leaving Colette, Martel moved her consciousness into the automated doll Tabatha that had been crafted to resemble her. She did this so that she would be able to observe both Lloyd and Mithos. When Lloyd rejoined the worlds and filled the Great Seed with mana, Martel and all of the souls of the Chosens who had their lives sacrificed were absorbed into the seed and fused together using Tabatha as a vessel to create Martel, the spirit of mana and the spirit of the new World Tree. A spirit who would always continue to exist so long as the tree was protected. Thousands of years later both Martel and the World Tree Yggdrasil’s lives fell into peril as a result of mana exhaustion caused by magitechnology. Unknown to Martel, demons had enacted a plan to drain the world’s mana by furthering Midgard’s magitech research and starting a war. With the world rid of the mana that was poison to them, they would be free to conquer Aselia. In order to save the tree, Martel spoke with Klarth, Cless, and Mint. She told them of how the World Tree took root when the world as they knew was first given its form and that all things spirit and magic would be lost without its mana. The three listened to her pleas for help and set out to stop the strain on the world’s mana. All was not lost however as the young healer Mint was able to retrieve a Unicorn’s Horn to strengthen her Cleric Artes. Using the horn, Mint was able to heal much of the damage done to the tree by the cannon’s destructive mana consumption. When the task was complete, Martel thanked Mint, but warned her that there had been no change to whatever was altering the flow of mana. Around One hundred and fifty years later, mana consumption had returned to normal after Dhaos had wiped the city of Midgard off the map to end their excessive magitech usage. Over the next few years Dhaos would also pay frequent visits to the World Tree in order to watch over it, Martel taking note of the beautiful, tall, blond haired man that would watch her with eyes filled with affection. A few years later after Cless and his friends arrived in the future, Martel informed them that both spirits and magic were safe, but that Yggdrasil itself was still weak from the effects of mana exhaustion. In order to heal the tree’s wounds, Martel would have to sleep for a very long time. Martel thanked Mint for her efforts in saving the tree and informed her that there was another life growing within herself that she wished to bestow upon another kind hearted soul such as her someday. After defeating Dhaos, Cless and his friends discussed what he had told them of his mission and his homeworld in front of the World Tree. They spoke of how Dhaos’ homeworld had lost its Giant Kharlan Tree and how he had traveled to Aselia in search of a Great Seed to bring back to Derris-Kharlan to save one billion lives. Before parting ways, Mint cast a barrier over the tree to prevent it from dying from mana exhaustion again in the future. Martel had heard their tale, and once they had all gone she summoned Dhaos’ remains before the World Tree and pleaded for the God*** of the land and heavens to forgive Dhaos for his sins; summoning the Great Seed that had been growing within herself and sent it to Derris-Kharlan along with Dhaos thus fulfilling his mission. In the original Narikiri Dungeon, Norn referred to Martel as “the savior of Derris-Kharlan and Dhaos’ lost soul” for her actions in restoring the Giant Kharlan Tree at the end of Phantasia. Martel has likely had the most voice actresses of any one Tales character. She was voiced by Iwao Junko in the PSX remake of Phantasia, with Rie Tanaka taking over the role in the Full Voiced Edition PSP version of the game. Rie also reprised her role in the OVA, Jessica Barrier voicing Martel in English release. In Namco’s GBA ToP localization Martel was played by Lynn Harris. Misa Watanabe voices Martel in the Japanese version of Tales of Symphonia, the ToS OVA, and Tales of Fandom vol. 2; her English voice in the game was Kim Mai Guest. Martel’s soul did become one of many that fused together to create the spirit Martel, but she isn’t the World Tree itself. The spirit Martel watches over the tree and refers to the tree and herself as being separate entities. Lloyd states in DotNW that Mithos became the tree while lending him his power in germinating the Great Seed. Although the future of the Church of Martel is uncertain by the end of DotNW, Martel is still worshiped as a Goddess in the time period that ToP takes place in. The focus of the church changed to encourage its followers to respect and protect nature, or as one preacher states- “Live harmoniously with nature, that is the teaching of Martel, the Mother Goddess”. The song that plays when the Great Seed is germinated and Martel becomes a spirit is called Revival It’s a rearrangement of Goodbye Friends which is played when Martel sent Dhaos’ body back to his homeworld with the Great Seed. The Unicorn was kept trapped in the bottom of Lake Umacy by Mithos because a successful vessel for Martel’s soul was guaranteed to develop Chronic Angelus Crystallus Inofficium because of how the Cruxis Crystal would react to the similar mana signature and it was needed to cure the disease. The fact that Yggdrasill is the source of all of the world’s mana is no longer common knowledge in the era that ToP takes place in. Not even magic scholars and high-ranking country officials know the importance of the tree. Cless and his friends had no idea until Martel told them herself. ***The central religions in both ToS and ToP are polytheistic in the Japanese versions of the games so I’m not sure if she just meant one almighty god or all of them. I’m going with what was said in the Phantasian Production’s PSX ToP patch though.